Train in film acting with working industry professionals from New York City and Europe, with the breathtaking city of Florence as your backdrop. Spend six weeks of your summer living in Florence and learning how to act on camera with working industry professionals from the New York Film Academy. You will spend the first and last week participating in PAA excursions and cultural activities, and exploring Florence on your own. The 4-week series of workshops provides you with a foundation for acting skills with a specific focus on acting for film. Classes emphasize the basic elements of the craft of acting using the techniques of Stanislavski, scene study, and monologue work as starting points. In conjunction with these classes, you participate in courses aimed at training you for the technical requirements of acting on a film set. You will also audition for the filmmaking student film projects. Your film training program will be in a newly renovated Renaissance-era building overlooking the Piazza San Lorenzo, in the heart of the historic center of Florence. This facility is across from the Basilica di San Lorenzo, one of the most famous churches in Florence, which houses the Medici Chapels, the burial place of the principal members of the Medici family. It is also steps away from the famous Piazza del Duomo, Santa Maria Novella, Ponte Vecchio, and the Galleria, which houses Michelangelo’s David. NYFA is also just one block away from the celebrated central market. For centuries, Florence has inspired and nurtured actors, artists, writers, and musicians; the city is one of the most important destinations for students, particularly those in the arts, studying abroad. 500 years ago, Florence was the epicenter of the Renaissance. If you were an artist, a person in finance, a liberal, or part of a minority, you would have come to Florence. Important and wealthy families, such as the Medici, were philanthropists and made Florence the outdoor walking museum that it is seen as today. In 2008, the Government of Tuscany and the Tuscan Film Commission invited the New York Film Academy to offer its world-renowned programs in a newly renovated facility overlooking the Piazza San Lorenzo, in the heart of the historic center of Florence. Currently, our summer workshop operates from a renovated renaissance era building across from the Basilica di San Lorenzo, one of the largest churches in Florence, which houses the Medici Chapels, the burial place of the principal members of the Medici family. The workshop facilities are steps away from the famous Piazza del Duomo, Santa Maria Novella, Ponte Vecchio, and the Galleria, which houses Michelangelo’s David. You will be just a block away from the celebrated main food shopping market. It is tough to imagine a more prominent and convenient location. Florence, and indeed all of Tuscany, provides perfect open-air sets for shooting movies and learning the craft of acting for the camera. Florence’s architecture is breathtaking: monuments, churches, bridges and ancient statues decorate the city in an incredibly unique way. Magnificent art galleries and the Uffizi Museum contain some of the most famous works of the most important artists in the world. During the training, you are encouraged to use these amazing venues as backdrops for your movies. You are also encouraged to explore and utilize other picturesque towns, such as Fiesole, Pisa, Lucca, Siena, and Chianti and to utilize these small towns and the natural environment of Tuscany as your sets—all a short bus or train ride away. You will live in a centrally-located apartment near the training classes and will share a room and flat with other students. You will have a common area, at least one bathroom depending on the size of your apartment, a washing machine, and a fully-equipped kitchen for cooking meals. You will attend a housing orientation upon arrival where you will receive your keys and information about security and who to call if you have an issue with the apartment. During this acting for film workshop, you will be taught by working industry professionals whose experience includes Hollywood, HBO, MGM, Walt Disney Co., Sony, NBC, Universal Pictures, ABC, and much more. The diverse international faculty is comprised of experienced instructors and professional actors, many of whom have earned their terminal graduate degrees from the most prestigious film programs in the United States. The instructors on this program are faculty from NYFA’s U.S. campuses in New York, Los Angeles and Miami, and are among the institution’s longest standing and most respected teachers. We often welcome guest lecturers from the Italian and European Filmmaking communities as well. Your peers during the training course will be incredibly diverse. This past summer’s enrollment compromised students from 22 countries, including India, Thailand, Iran, Macedonia, Jordan, Canada, and Nigeria. The multiplicity of global students means that you will not be studying in a monocultural “bubble” as in many programs, including semester and faculty-led offerings by schools and universities. You will interact with local Italians to organize your productions, and will work with many peers who have English as a second language. You will book a flight to arrive at Florence’s Peretola Airport (FLR) before noon on your arrival day. You will gather at a pre-determined meeting point where our site director Alessandro will greet you and wait with you as other participants arrive. Once the last person has come through customs and joined the group, you will all travel together to your housing in shared apartments in Florence’s city center. You will attend a short housing orientation and a neighborhood tour so you can know immediately where to find the nearest grocery store, ATM, and other amenities. The rest of the afternoon and evening will be free time to unpack, settle in, and explore your neighborhood. The following day, our site director will lead a full orientation to Florence including detailed health and safety information, cultural norms, and how to navigate public transportation. For the rest of your first week in Florence, you will have ample free time to explore the city and the surrounding areas, and will be invited to join several free activities and excursions such as a Florence market and museum visit and tour, a day trip to nearby city such as Bologna, Chianti, Pisa, Maremma, or Lucca, an Italian cooking class, a Fiesole hike and dinner, a pizza making class, and a Traiditional Florentine Aperitivo Evening. Registration for your workshop will take place between 10:30 and noon on the Monday of your second week in Florence, followed by an orientation to the course and your instructors. From the very first day of class, the focus of the workshop is to learn through making films. Each participant writes, produces, directs, and edits his or her own films, and rotates among crew positions when your classmates shoot. No matter how beautiful the cinematography or impressive the special effects in a film, audiences are drawn in by the struggles of the characters on screen. On set, dozens of crewmembers whirl about, twelve-kilowatt lights bore into the eyes, focus tape is pulled to the actor’s cheek, and the actor is still expected to give a believable and moving performance. The Four-Week Acting for Film Workshop allows you to participate in a short training workshop that demands full immersion into learning the craft of acting. The Four-Week Acting Workshop provides you with a thorough foundation of acting skills with a specific focus on acting for film. The workshop is a full-time program, and you must be prepared to make a serious commitment to its completion. Classes emphasize the basic elements of the craft of acting using Stanislavski’s System, scene study, and monologue work as starting points. In conjunction with these classes, students participate in courses aimed specifically at training the actor for the technical requirements of acting on a film set. The four-week workshop qualifies for three academic credits via an academic transcript issued by Endicott College. Performing Arts Abroad has a special partnership with the New York Film Academy College of Visual and Performing Arts (NYFA) in Florence, Italy to offer some of the highest level film training in the world. These workshops in Florence are open to participants across all disciplines. Whether you are already a budding actor, whether you want to learn how films are made, or what it takes to create a performance, you will benefit from this intensive training course. We welcome anyone who wants to integrate filmmaking and other visual arts disciplines into an international cultural experience. Your availability in U.S. Eastern Time for a 30 minute Skype interview. We will contact you with an acceptance decision within two weeks of your Skype interview and finishing your application. Remaining balance due six weeks before your program start date. You do not have to be a student to apply for this program. However, if you would like to receive academic credit for the training you will need to provide your academic transcript, or a copy of your high school diploma or GED. There is no language requirement for this workshop, as all teaching will be conducted in English. However, we highly recommend learning as much Italian as possible before the program to give you more access to the city while working on your films. While no prior experience is mandatory and classes are differentiated to a variety of levels, we recommend applicants have at least one year of acting experience. We are looking for open-minded, flexible applicants who can clearly convey their passion for film and an acute interest in international travel and exposure to new ideas. Train in film acting with working industry professionals from New York City, Paris and beyond, with the breathtaking city of Paris as your backdrop. The city is your set, and your internship is the lens. 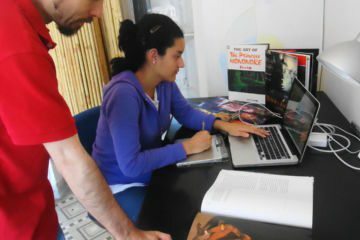 Refine your film and animation skills with a customized placement at an organization in the heart of Barcelona.